The bio of Joan Rendell | Launceston Then! Joan was born in 1921 to Gervase and Edith Maud (nee Culley) Rendell at Launceston. Her father was an Accountancy Clerk in the 1911 census but then joined the Admiralty and much of Joan’s early childhood was spent travelling. When war broke out in 1939, the family were living in London and, like others, decided to evacuate to the country. Inevitably, they sought a refuge back “home” in Cornwall, buying the bungalow at Tremarsh that was to be Joan’s base for the rest of her days. Joan was an English historian, writer and phillumenist. For most of her life her home was at Werrington. Joan was the author of more than 30 books mainly on Cornish or craft subjects such as; Country Crafts, Cornish Churches, Collecting Natural Objects, Hawker Country, Pressed And Dried Flowers, Lundy Island, Around Bude And Stratton, North Cornwall In The Old Days, Corn Dollies, Gateway To Cornwall, Cornwall Strange But True and her last book Launceston from Old Photographs. Her big hobby was collecting old matchboxes and it was believed that she held one of the largest in the world with upward of 300,000 in her collection. 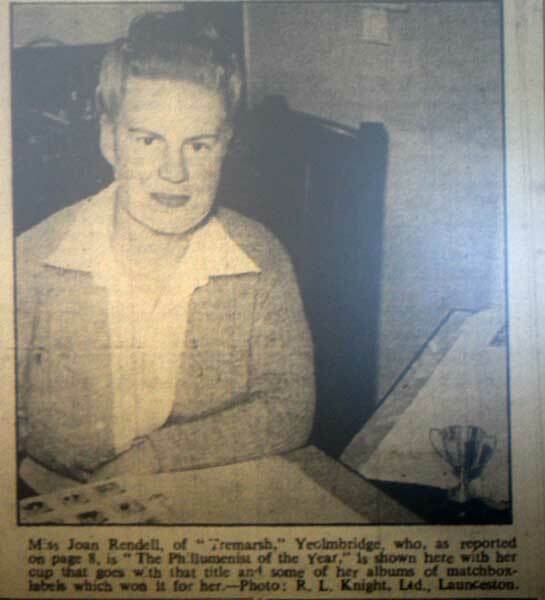 In 1953 she was named ‘The Phillumenist of the Year’ (below). She was the Parish Clerk for Werrington for nearly 65 years and also volunteered for several organisations, including the National Savings movement, for which she was awarded the MBE in 1958 and in 1977 she was awarded the Queen’s Silver Jubilee Medal. In September 1980 she was made a Bard of Gorsedh Kernow, taking the name Scryfer Weryn (Writer of Werrington). She was also an avid collector of matchbox covers and had an estimated collection of 300,000. Another interest of hers was corn-dolly making about which she also wrote a book. She was a self confessed eccentric and drank only cold water and lived mainly on raw vegetables. Joan tragically died in a fire at her bungalow, Tremarsh, Werrington, near Launceston, on Tuesday 4 May 2010.